May is Melanoma Awareness Month, and Hadassah is very proud of Hadassah Hospital’s trailblazing new treatments that are curing patients of typically fatal metastatic melanoma. Steward Greenberg, a lawyer from Miami, Florida, came to Hadassah after he was given no hope by his doctors in the United States of surviving his 4th stage Melanoma. The innovative new treatment he was given by Dr. Michal Lotem, head of the Hadassah Center for Melanoma and Cancer Immunotherapy, has saved his life. Prof. Lotem, head of Hadassah’s Melanoma and Cancer Immunotherapy Center, explains: “We developed a way of genetically engineering the few thousand immune system cells from a metastasized tumor into trillions.” And she is not stopping there. She is working to transform immune cells into even more powerful cancer killers so more patients can be saved from this deadly disease. Hadassah is now giving hope around the world by sharing this innovative treatment. Read more in Hadassah Magazine about Hadassah’s Prof. Lotem. 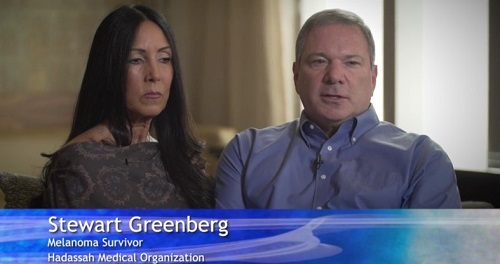 Watch Steward Greenberg tell his personal story.